The ecommerce industry is a highly competitive space. That’s because the popularity of online shopping is growing at a rapid rate. Last year, retail ecommerce sales surpassed 2.3 billion dollars across the globe. This number is expected to double within the next three years. It’s safe to say that consumers will continue buying from ecommerce platforms. This news should be extremely encouraging to ecommerce brands. But with so many competitors across the world, you’ll need to come up with ways to separate yourself from the crowd if you want to survive and thrive. In the past, I’ve told you how to get your first sale from your new ecommerce website. But now that you’ve got those initial sales out of the way, you need to come up with a sustainable growth strategy. You can do this in a number of ways. For example, leveraging social commerce to increase ecommerce sales is a profitable marketing tactic. Offering discounts, targeting the right audience, and accepting lots of payment options are just a few of my favorite ways to boost ecommerce sales fast. However, you need to take this strategy one step further and understand the consumer buying behavior. We know that 85% of consumers use Google to find products before making a purchase. Roughly 33% of clicks go to the top result of Google’s SERP. And 75% of all clicks are made on the first page of search results. Basically, if your ecommerce site isn’t a top result when a consumer starts a product search, you won’t generate new leads with organic traffic. How do you improve your search ranking? Search engine optimization. Follow the tips I’ve outlined in this guide, and you’ll be able to drive ecommerce sales with SEO tactics. If you want to have a successful SEO strategy, you need to start with keyword research. This will help you understand the search terms that consumers type when they’re shopping for products you’re selling. Google AdWords is a great place to start. 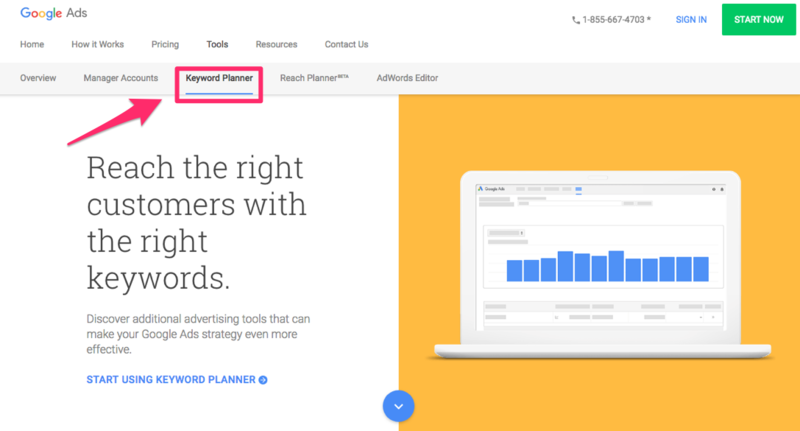 The keyword planner tool will show you words and phrases related to your products, services, and industry. You’ll be able to see how frequently people search for these words. The results will also show you how the volume of these words and terms change each month. Using this information, you’ll be able to update your site accordingly so it matches the most popular search terms. These subtle changes on your ecommerce site will increase the chances that your pages will appear as a top search result. Now you’ll receive more organic search traffic that will ultimately help you drive sales. Once you have your keywords, you’ll need to add them to your website. Sure, you can add them to your product pages and descriptions, but that alone won’t maximize your reach. You want to include these keywords in as many places as possible on your site. That’s why you need to add a blog to your ecommerce site. Research shows that the average number of words on the first page of Google results is 1,890 words. I’m willing to bet your product descriptions aren’t that long. But that’s the perfect length for a blog post. Your blog gives you the opportunity to create internal links. These links can direct visitors to other blog posts or to product pages. Blogging increases the chances that your brand will be able to create backlinks as well. Other websites may reference or feature information from one of your posts. As a result, they’ll credit you as the source with a link. The combination of these internal links and backlinks will improve your organic search ranking. Plus, these blogs will give you an opportunity to showcase your products and services. You can provide demonstrations or step-by-step guides that encourage visitors to make a purchase. More than half of all searches are at least four words. You need to keep this in mind when you’re conducting keyword research, which we discussed earlier. Add long-tail keywords to your ecommerce site. Put them in the names of your products and their descriptions. Long-tail keywords don’t have as high of a search volume. This means there is less competition from other brands using keywords for their SEO strategies. But it will increase the chances you’ll be a top search result for these specific terms. That’s why long-tail keywords typically have higher conversion rates. Using the example above, let’s say you’re an ecommerce site selling bicycles. You obviously have a ton of competition in this space. But if you sell beach cruisers, that’s a little bit more specific. The search volume for the phrase won’t be as high, and your likelihood of conversions will increase slightly. Take that one step further, and add even more descriptive information. If you use “black 10-speed beach cruiser” as a long-tail keyword, you’ll reach a very specific audience. Chances are, if someone uses this phrase to search for the item, you’ll be one of the top results. This makes the consumer’s life easier too. Instead of manually scrolling through product pages on a website to find a specific item, they’ll just search for it using descriptive keywords. Since you’re offering exactly what they’re looking for, they’ll be more likely to buy from your ecommerce site. Without getting too technical here, I’m going to explain the basic concepts of crawling and indexing. All major search engines, such as Google, use bots to index the information contained on websites. These automated bots are also known as web crawlers. The information on these pages is stored in the search engine’s index. When a consumer searches for a term, the search engine references the index and chooses the pages with the most relevant results. But if the architecture of your website is too complicated, the bots may not index the results properly, and your site won’t be a top search result. By simplifying your architecture, you will make your site easier to read, and it will appear more trustworthy as well. A simple site architecture will also make it easier for your visitors to navigate once they land on your page. This will help increase your chances of getting more conversions as well. But we’ll talk more about simple designs shortly. Errors on your site will have a negative impact on your search ranking. As I just discussed, search engines use bots to scan content on the web. Those search engines don’t want to send consumers to sites that have problems. I’m assuming you don’t intentionally have problems with your site. You may have some broken links without knowing it. That’s why you need to have tools in place to help you identify any errors so you can fix them as soon as possible. This tool is a website crawler, similar to the ones used by search engines. You can get the SEO of your pages analyzed to see what needs to be improved or fixed. The tool will identify server errors, broken links, and audit redirects. This software will even analyze the titles of your pages and find duplicate content. You can integrate the Screaming Frog software with your Google analytics. This will help you get more relevant results in terms of your conversions, bounce rates, and ecommerce transactions. We know that 60% of all searches come from mobile devices. If your website isn’t mobile-friendly, it won’t be a top search result. You need to recognize how people use mobile devices. As you can see, 80% of people use smartphones. Just 14% of people use only a computer without a mobile device. Your ecommerce brand needs to understand the mobile trends dominating 2018. Use the knowledge to update your ecommerce site. According to Alexa rankings, more than 80% of the top websites are mobile-friendly. Furthermore, 48% of consumers use search engines to conduct research from these devices. Let all of this information sink in for a moment. Ask yourself whether your ecommerce site has adapted to these trends. If not, it could be the reason why search engines aren’t giving your site a high ranking. Optimizing your ecommerce site for mobile devices will help you get more traffic from consumers browsing from their smartphones and tablets. If your pages take too long to load, search engines will penalize your ranking. This is relevant to the earlier discussion about identifying and fixing errors on your site. Sometimes, these problems could be the reason why your pages are taking so long to open. If there aren’t any errors on your site, you may just have a design that’s too complicated. But we’ll talk about that in greater detail soon. Some of you may just need to upgrade your web hosting service. It can be tempting to select the cheapest option, but it’ll hurt you in the long run. As you can see, just a few seconds can drastically change your bounce rates. This is obviously not good for your business. Let’s say you were able to get ranked on the first page of search results. A prospective customer clicks on your page. That’s great news. But the page takes too long to load, so they leave and go to a competitor’s site instead. You just lost your chance to make a sale. Do whatever you can to increase your page loading speed. You want it to be as fast as possible. This will improve your search ranking and help you drive sales. A complicated design could be one of the reasons why your site isn’t loading fast. That’s why websites with simple designs have higher conversion rates. This also relates to your site’s architecture—a topic I discussed above. If your pages are cluttered and tough to navigate, search engines won’t rank them high. Furthermore, the simplicity of your website will encourage users to stay on the pages longer. Google’s algorithm will recognize this and rank you accordingly. Yes, you’re obviously trying to improve your SEO. But ultimately, you want to drive sales. Websites with complicated navigations and long checkout procedures cause consumers to abandon their shopping carts. Here’s something else to keep in mind: 75% of consumers say they judge a brand’s credibility based on the design of the website. And 85% of a website visitor’s first impression of a site is related to its design. If you are not familiar with meta descriptions, allow me to explain what they are. These are short, 155-character-long, summaries of pages’ contents. From a consumer perspective, a page meta description gives them more information about what to expect when they click on a link from search results. There is some debate as to whether these descriptions directly impact SEO. However, it’s clear that the right meta description can help increase the chances of getting clicks when your site comes up in search results. Meta descriptions should contain keywords as well. Try to make yours unique so it stands apart from the crowd. As you can see from the results above, each site uses a slightly different strategy to give it an edge over competors. To generate new leads and maximize the reach of your ecommerce website, you need to focus on your SEO strategy. Add actionable meta descriptions to your pages that encourage consumers to click on your site over other options in the search results. Use this guide as a reference to enhance your ecommerce SEO strategy. How is your ecommerce site using SEO tactics to drive sales?